When it comes to perfume inspirations, designer Naomi Goodsir had an original one: bakelite — one of the first plastics. I admit to laughing as I read Nuit de Bakélite1 PR materials (Goodsir collects bakelite objects). But who am I to laugh? I'd happily work with perfumer Isabelle Doyen myself if she'd help me turn some favorite things into gorgeous perfume. Isabelle, let's create Jour d'Essence de Térébenthine2or La Grotte des Boules de Mites3. Just this week Angela here at NST reviewed a perfume made with concrete in mind! The most interesting thing I read about bakelite concerns its smell: "When rubbed or burnt, Bakelite has a distinctive, acrid, sickly-sweet or fishy odor. "4 I don't have any bakelite items around the house to rub or set on fire so I'll let my imagination take it from there. Apparently, in Doyen's search to create a "bakelite" aroma for Goodsir, she came upon the scent of "green tuberose" — Nuit de Bakélite was born. 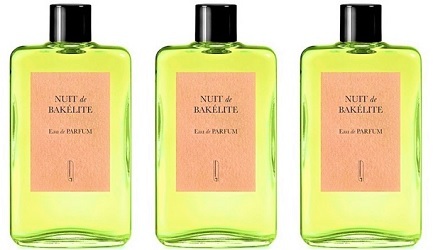 Upon application, Nuit de Bakélite smells of sturdy, fresh herbs: furred, tough, torn and pounded; the aromas are dense and 'emerald-green' — not fresh (angelica stands out). Suddenly, a smokiness appears, mixing with the heady, volatile vegetal fumes. Next up is a potent mix of violet leaf, leather and tobacco. In mid-development, a "jungle" flower note emerges: spicy, sweet, with a tinge of rich loam mixed in, and this note takes us to 'dark' tuberose mixing with a brighter-hued resin-y smell (the "bakelite accord?") The experience of wearing Nuit de Bakélite is rousing: it's as if I had sprayed (all at once...and lavishly) different parts of my body with L'Artisan Parfumeur Timbuktu, a scent by issey miyake, Olfactive Studio Ombre Indigo and Naomi Goodsir's own Iris Cendré. I am wowed — in a good way. No doubt about it: a bottle of Nuit de Bakélite will be mine VERY soon. Naomi Goodsir Nuit de Bakélite Eau de Parfum is unisex and has great lasting power; it's $187 for 50 ml. 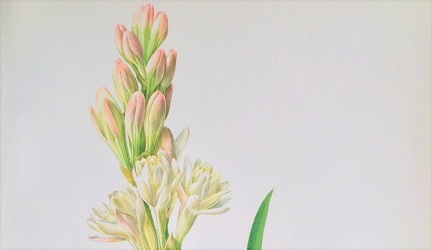 Note: top image of Polianthes tuberosa [cropped and color adjusted] via Monika at flickr; some rights reserved. 1. Perfumer Isabelle Doyen; listed notes of galbanum, angelica, violet leaf, orris, karo karounde, tuberose, leather, davana, styrax, tobacco, labdanum, gaiac wood. This makes me so sad. It sounds so great on you and it was just awful on me, right down to my person saying “ew, what is that, go away.” I have all of the other NG line and wish I could smell what you and others are smelling! Amy, too bad! But it’s not like you don’t have 100,000 other fragrances to choose from! Ha! I know. And that’s just in my dresser! A scent that smells like old, burning plastic (and sells for $187 per 50 ml)? Fragrance industry, we have a problem! BF, if burning plastic smelled like this I would replace my wooden logs…burning bakelite WOULD BE prohibitively expensive though…. I have a difficult time with Iris Cendre (I only have a dabber and it smells enough like wet cigarette ash that I don’t really want to try it again), but this one sounds so interesting . . . The review is quite compelling! Ajellyfish…this one does not smell like an ashtray left in the rain…to me…hope you can sniff it. I tried it and I liked the vegetal opening, very interesting, and I loved what was the third phase to me (mmm tobacco!). But the middle phase, the burnt plastic/bakelite got a bit weird and cold and awkward on my skin. Oh and i applaud this brand for releasing something different, and NOT 6 scents at once, three times per year. I also liked Bois d’Ascese. Not wearing it a lot, and my sample is still half full, but it is almost meditative. I used it when I was alone and needed to focus on a specific task. Jiji: this is the perfect brand for 10/20 ml options; the scents are powerful. I used to collect bakelite jewelry, and rubbing it was how we determined if it was real or a fake. Is this a tuberose scent, or something else with some tuberose present? Sounds like the latter. Floragal, there is tuberose for sure, but to me it’s part of an ensemble, not the star. Kevin, I was wowed by this scent, too, and that was just from a tester strip. Cant wait to try this on skin! AnnE, it does smell great on a test strip, but even better on skin. Enjoy. I like the name very much. Haven’t loved anything that I’ve tried from this brand so far, but I’ll give it another go. Shame it doesn’t have some kind of crazy, Carmen-Miranda-ish Bakelite cap, though. I had quite a similar impression. Fascinating scent with lots of layers. Usually I am not into flowers in fragrances, but this smoky Tuberose was close. Still, the middle phase came out a bit too sweet on me. BTW: Tauer perfumes caps are made from Bakelite! m3000…I didn’t know that, have never bought a Tauer. Can’t wait to try this one, thanks for the review. I love this line. Cazaubon, you’re welcome….hope you can try this soon. I grew up with the smell of hot bakelite with my father, an engineer, doing technical stuff with PCB and circuits and stuff he wished I would take in interest in. I wouldn’t describe the smell as fishy. Acrid maybe, and quite nice if not very perfumey. Not like regular plastics at all. And labdanum smell a lot like plasticine, strangely enough. Des esseintes, it would be so fun to smell a room filled with warm bakelite as you describe.